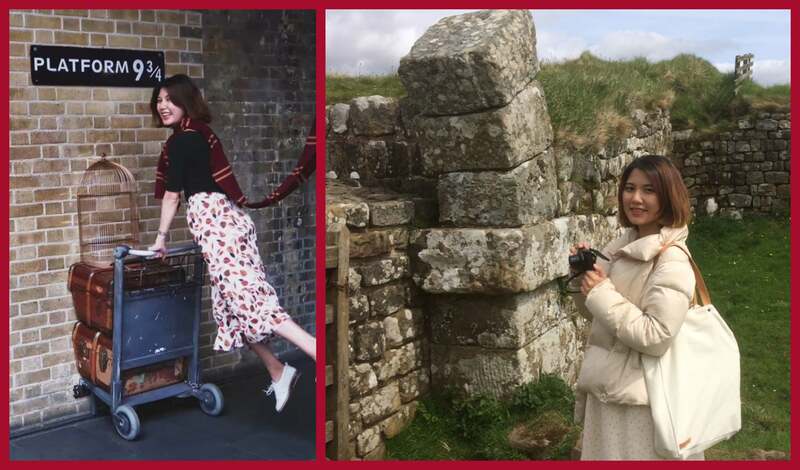 In May 2018, we were delighted to welcome the prolific Chinese blogger, Yuan Chao (西西里玩不停), AKA Sicilia, to the UK as a guest of London North Eastern Railway (LNER). Sicilia began her journey in London, and travelled all the way to Edinburgh via first-class train luxury, stopping at Durham, Newcastle, and York en-route. Her verdict was ‘I have always loved Australia, but actually I think the UK is more classy!’. Our brief from LNER, then Virgin Trains East Coast, was to spread the word to Chinese travellers that catching the train is the best way to travel to London and the UK’s most beautiful cities. In order to achieve this, we set up an official Weibo account for LNER through our Beijing office. Setting up a Weibo account is one thing, but building followers is quite another. To maximise the reach of this trip and secure flights, we negotiated a joint promotion with Beijing Capital Airlines to run a competition on its social media accounts to find the best travel blogger to come to the UK and travel the East Coast. This promotion was launched in April 2018 on Capital Airlines’ Weibo account which has over 1.3 million followers. The travel itinerary, including a full holiday package priced as a bookable product for its users, was hosted on HiApp, the Hainan Group’s new online travel platform. 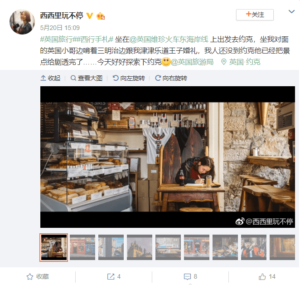 HiApp promoted the itinerary to its 739,000+ Weibo followers. Sicilia was the deserved winner of the competition. Within just one month of launch, the LNER Weibo account had 10,100 followers. In addition to LNER and Capital Airlines, we worked with eight other partners on Sicilia’s itinerary, including VisitYork, Visit County Durham, Visit Scotland, Marketing Edinburgh, Native Apartments, Household Cavalry Museum, Randall and Aubin and English Heritage. We constructed an eight-day itinerary to cover every step of Sicilia’s UK trip. We were delighted with the results of this project which exceeded all our expectations. Sicilia shared her travel experiences throughout the trip on the popular Chinese social media platforms, WeChat and Weibo. She posted 12 posts on her official WeChat account including a great selection of images with each post, and published nine posts on Weibo, where she has over 144,000 followers. 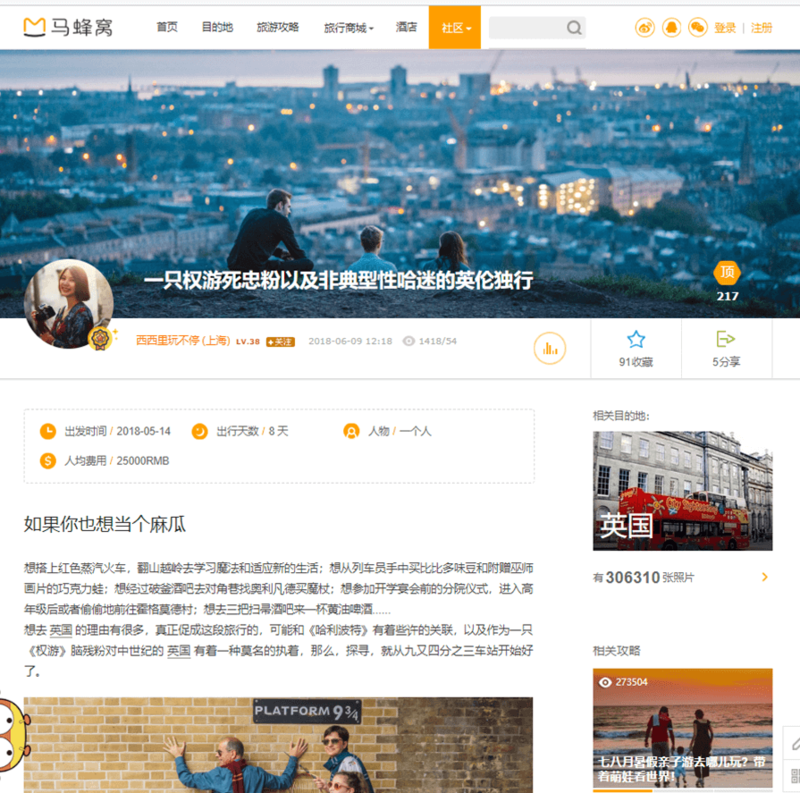 She wrote an extensive blog post which has been published on China’s most popular travel review site, Mafengwo, as well as Ctrip, Qyer, Autohome, and XCAR BBS, where it received outstanding user engagement. On 3rd July, the blog made the coveted home page of Ctrip’s mobile site. One week later on Tuesday 10th July, the blog was featured on Mafengwo’s home page for five days, a place awarded to the site’s top five blogs. The post made it to Qyer BBS’s homepage on Wednesday 11th July where it was tagged and promoted by Qyer as recommended content. On 3rd August, it reached the home page of XCAR BBS, and lastly, on 22nd August, the blog featured on the home page of Qyer’s main site. As of August 2018, the blog’s total views have reached over 171,000 across the five platforms, and it has over 5,360 likes and 1,220 comments. 4,225 users have saved the blog for future reference when planning their next trip abroad. These figures will continue to grow as budding Chinese travellers interested in visiting the UK are drawn to the blog. Sicilia enjoyed her trip so much that she intends to come back to the UK in the summer of 2018, this time bringing her family with her.